Science communication strategies often focus on communicating to other researchers within your field or to the general public. Interdisciplinary conversations require a mix of communication skills to bridge the gaps in domain knowledge and overcome the jargon. 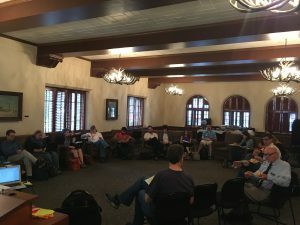 At the University of Texas at Austin, we just wrapped up a 3-week collaborative and interdisciplinary Pop-Up Institute called Seeing the Tree and the Forest: Understanding Individual and Population Variation in Biology, Medicine, and Society. Pop-Up Institutes are a novel framework for collaboration being funded for the first time this year by UT’s Vice President for Research. Designed to be longer than a conference and less permanent than a research center, these Institutes bring diverse experts together, into the same physical space, to work. In our Institute alone, we had researchers from multiple fields of biology, statistics, nutrition, medicine, public health, anthropology, sociology, ethics, and physics. Our Pop-Up Institute tackled the causes and consequences of individual and population variation. Individuals differ in a variety of ways, from their genetics to their lifetime health. Understanding the underlying causes of this variation across individuals and populations is critical to the success of both the individual and the population within which they live. However, the directionality of cause and consequence is complex, and the pertinent factors that underlie why individuals are the way that they are crosses traditional research boundaries. Two additional Pop-Up Institutes were funded this year. The first brought together social scientists to study Discrimination and Population Health Disparities. The second focused on Building a Digital Humanities Ecosystem for Innovative Research in the Liberal Arts. 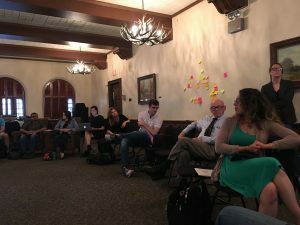 One of the highlights of our Institute was talking to each other—faculty, administration, staff, postdocs, and graduate students, together—about our research and discovering shared interests, approaches, and future goals. However, communicating with each other wasn’t always easy. Here are some approaches we used to build bridges across disciplines. First, we introduced ourselves. This seems simple, but how often do we take the time to learn who is in the room, especially if there’s a large group? But the time invested here will be worthwhile. Not only does it start the getting-to-know-you process, knowing the areas of expertise represented facilitates collaboration. Second, we participated in a number of activities together that required communication but had their own end goals, other than research collaboration. 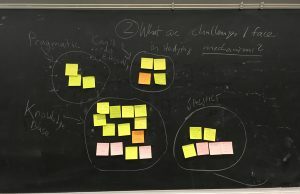 For example, many BEACONites will be familiar with the Post-It note exercise where an overarching question is posed to the group and each participant answers on a Post-It note. 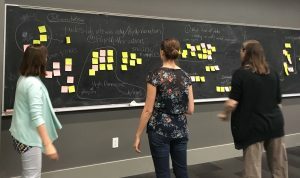 All of the Post-Its get placed on a wall, and participants work together to organize the answers into categories. This organizational process is a great motivator for conversation! Third, we explicitly tackled the differences in vocabulary and domain knowledge by building a common glossary. We started with a list of important words that participants used when discussing their own research, prioritizing those that prompted the most questions and interest, such as health, variation, mechanism, learning, achievement, personality, and development. The resulting discussions were fascinating and highlighted areas of overlap and gaps to be addressed among disciplines. Finally, the importance of time cannot be overstated. While one-time workshops can be very productive, building relationships and developing ideas takes time. For the Pop-Up Institute, the goal was to work together in the same physical space, but technology can facilitate additional formats, such as video conferencing and collaborative digital workspaces. This entry was posted in BEACON Researchers at Work, BEACONites, Member Announcements and tagged BEACON Researchers at Work, communication, Outreach. Bookmark the permalink.